This is the line we use in our family when things are starting to spin out of control. When we have a hundred things to get done and the feds are closing in. It's a line from Goodfellas and Henry Hill is on the phone saying he has to get his brother from the hospital, drop off some stuff for Lois, make sure to stir the sauce and then get the guns to Jimmy. Meanwhile the feds are flying over his house in helicopters because the jig is up. Time to join the witness protection program. So that's what it's like here. We're juggling a million little things, stirring the sauce AND trying to get the damn guns over to Jimmy's before we put our house on the market. Which is in two weeks. Meanwhile I signed up for a three day workshop to learn some new media techniques with Jesse Reno, which will likely be completely awesome if I can keep myself focused, which starts in TWO DAYS. But before all that I need to get keys made for our realtor, get paint chips for the painters who are coming at 9am on Monday and box up everything else that's still in the house while staying on top of my orders in what has been a freakishly fertile February (sales-wise) so that on Monday morning we can drive down to southern California to see my mom and go to Disneyland. And the day after we get back the stager comes and the house has to be immaculate for the next 2-3 weeks or until we sell. This is starting to make me twitch since we usually can't go more than 12 hours before the house looks like a helicopter actually landed in the living room.And those are the twelve house when the kids are asleep. Please go vote for my friend Jenn Louis, who runs an incredible restaurant in Portland called Lincoln, in CNN's Eatocracy poll. This is the restaurant where I took Aimee during that fabulous weekend last December. Sign up for my friend Liv's Feel Good Deal of the Day. Liv is magic. And she may possibly have the ability to stop time. This is the only way I can explain how she's able to put out a daily newsletter (and blog everyday!) with great inspirational, motivational content and fabulous deals! 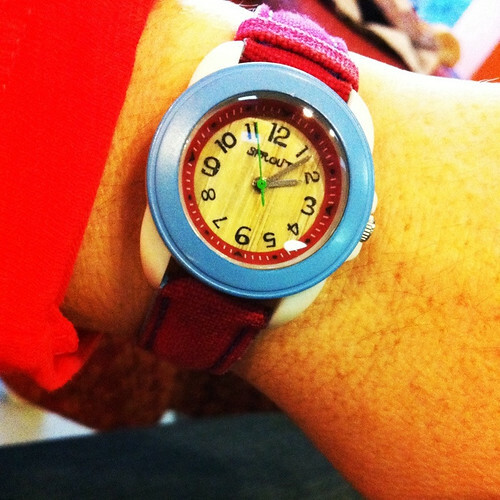 How cute is my new(ish) watch in the picture? It's from this company and the whole this is biodegradable. I think you can bury it and more watches will grow. And now I'm off to stir the sauce (and then get the guns to Jimmy). If you don't ever hear from me gain, it's because I joined witness protection.